Britain’s dustiest stoner rock outfit STEAK just unveiled the title and artwork for their debut record, to be released this September via Napalm Records. 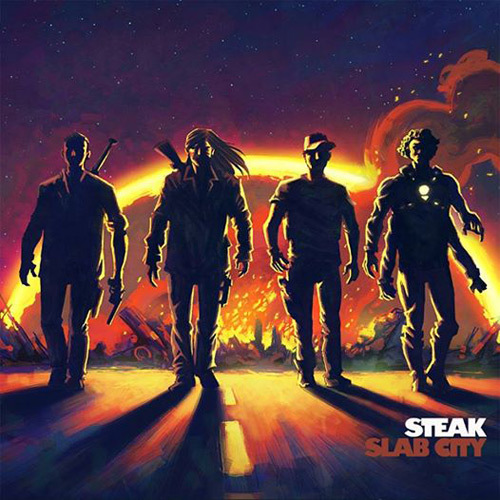 Get ready for a thundering breakthrough into STEAK‘s Slab City! After two critically acclaimed EPs Disastronaught (2012) and Corned Beef Colossus (2013), the fuzzy foursome flew out to South California this March, and spent two weeks at Palm Springs’ renowned studio Thunder Underground to record their debut album, coherently called Slab City. Slab City was produced by Harper Hug (Vista Chino, Brant Bjork, Nick Oliveri) and co-produced by Unida’s guitarist Arthur Seay, and will feature guest vocals from desert rock legend John Garcia. As for each one of their releases, the artwork was made by DC Comics artist Eduardo Ferigato and falls within the course of STEAK‘s epic saga. Within two years, STEAK have established themselves as one of the British stoner rock scene’s most satisfying acts. Following the sandy steps of their American elders Kyuss or Fu Manchu, Their music is driven by ballsy riffs and contagious grooves, tinged with moments of pure cosmic escapism. In the meantime, you can stream the video for the track ‘Liquid Gold‘.